This Chilean wine came in a big heavy bottle, the broad shouldered type favoured by Californian winemakers. I did double check it wasn’t a Californian wine based on bottle shape and weight alone. It’s not. It’s a Chilean wine made by a French winemaker. 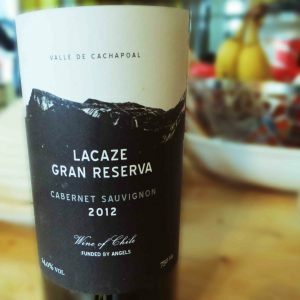 This Cabernet Sauvignon comes from the Cachapoal Valley south of Santiago. Oddly, the mintiness you often find in Cabernet Sauvignon’s from this area isn’t the slight hint of mint that Cabernet carries with it, but a more direct eucalyptus flavour that works its way into the grapes both from the soil up and off the skins – there’s wild eucalyptus growing all around, so to get a better wine you have to hack them all down and get rid of the flavour. Otherwise it’s like leaving half an onion, or some stinky cheese in the fridge – everything will taste of it. Lacaze went ahead and culled the eucalyptus, but as it’s Chile I can only hope that this didn’t result in thousands of homeless koalas queuing up at the docks to get the next boat back to Australia. Let’s hope that image doesn’t have you spilling big salty tears into your wine to ruin it. Back to the wine. It’s a deep purple colour, with thick legs. It smells of blackberries and a little oaky vanilla. It’s dry, but the fruit gives it a little sweetness. The acid is medium but the alcohol level is high, combine that with smooth soft tannins and a blackberry and blackcurrant fruit blast and it’s quite full bodied. There’s a good zip of wood tannin too with a vanilla touch, which sweetens it up a little. The fruit is really fresh and lively, I suspect this wine might have tasted a little more complex and relaxed next year. It certainly benefited from a little aeration and standing around time. This vintage is sold out. I’ll look to buying the 2013 vintage from Naked Wines, but I think I’ll hide it from myself and try drinking it in 2016.